The story about Ægir started already in the late 1980`s– and on the other side of the Atlantic Ocean– when Evan Lewis started with homebrewing in Upstate New York. It´s been said that Evan smuggled bottles of his brew through the back door of his high school for the principal to try, and instead of criticizing he offered constructive feedback about how the beers could be improved. Some years later Evan met Aud Melås from Sogn in Norway, and it was love at first sight. In 2004 Aud and Evan got an offer to buy the restaurant “Furukroa” in Flåm, and they decided to jump on the opportunity and leave California for her home country. After they came to Norway, the couple had a conversation on how to make the business more attractive, including building a Viking pub. Evan’s obvious question was: why not a pub brewery then? In 2007 they established Ægir Brewery with Aud in control of the numbers and Evan as the busy brewer. The brewery was named after the god of the seas, Ægir, from the Norse Mythology. He was according to Odin the best brewer in the world. 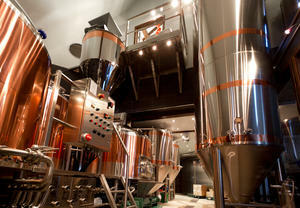 Ægir Brewery was one of the first craft beer breweries in Norway – and definitely has the most distinctive brewpub. 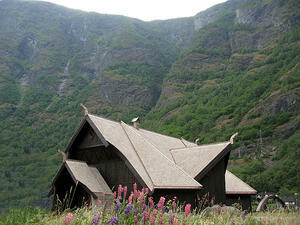 Inspired by Ægir´s mythological hall under the sea, the brewpub is built to give the feel of a Viking style longhouse. You have to go at least a thousand years back in time to find an atmosphere like this; open fire, dragon carvings and a stave church roof that wasn´t built in a day. While the mythological Ægir had a brewing kettle a mile deep, Evan’s brewpub started with a capacity of just 1000 litres per brew. Since the start Ægir Brewery has continued to grow and in 2012 expanded with a brand-new production facility that today boasts a capacity of a million litres per year. Ægir´s mission is to provide a wide range of beers with a focus on pairing well with food, and there are currently more then forty different products in the range. In 2011 a small distillery was added to the brewery, making small batches of artisanal aquavit and gin. Evan and his brewers at Ægir don’t only create their own twists on well known beer styles, but are also constantly testing new flavours and ideas. The products are always built on the same foundation: fresh mountain water, good ingredients and a sense for the small details that give the best taste. 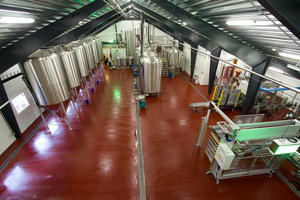 The brewery has ten employees who all share a passion for craft beer, brewing and quality in all that they do. The logistics manager, the lab person, the brewers, the beer guru and the packaging crew all have one common goal: to give you, the happy beer drinker, a great experience. The international team hails from Norway, the USA, Poland, Italy, Germany, Cyprus and England and they all ended up in Flåm based on their backgrounds and the drive to do what they love. The export market has also become very important for the brewery and makes up an increasingly large part of the yearly volume. Ægir Brewery is currently exporting to twelve different countries.